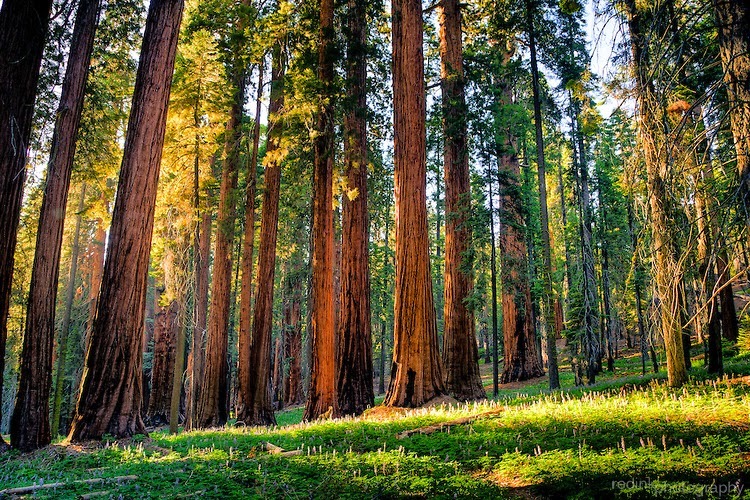 The Sequoia Giganticus that are too large for you to imagine and difficult to grasp when you can touch them, are about three hundred miles from here, in Sequoia National Park. There are two groves in Yosemite (a hundred miles closer) that would satisfy most people but I think not you. The botanical name of the giant sequoia is Sequoiadendron giganteum. Giant sequoias are the most massive tree species on earth. The genus sequoiadendron can be traced to the Triassic Period of 200 million years ago. The giganteum is the only surviving member of the sequoiadendron genus. The sequoiadendrons were the dominant trees in North America and Europe from the Jurassic to the Cretaceous. They reigned from 180 to 35 million years ago. The sequoiadendrons then began to recede in favor of species that were better adapted to a cooler and dryer earth. Today they grow wild in only the Sierra Nevada Mountains of California. There the ancient species found a refuge where the conditions remained favorable to their continued existence.